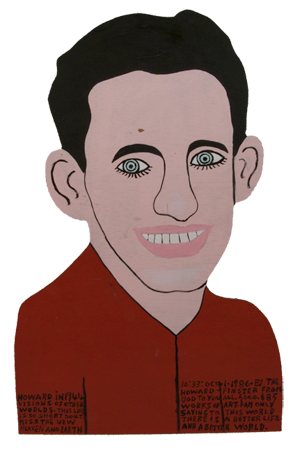 Born 1926, (d. 2001) Alabama, lived in Summerville, Georgia. 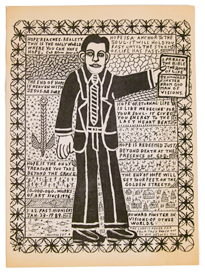 Study and documentation is exhaustive regarding the life and work of the Reverend and man Howard Finster. His self-taught brand of sacred art numbered over 50,000 by the time of his passing in 2001. He was inspired and believed the sermons encrypted on each of his works would reach a broader audience than mere spoken words. 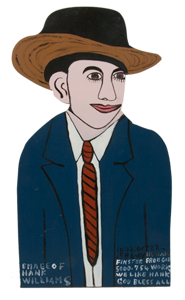 We purchased "Howard in 1944" in the fall of 1988 from Art Jones Gallery, Cincinnati, Ohio. 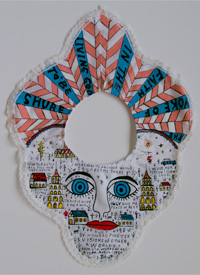 It is a painted cut out approximately 24" tall. Howard inscribed on the front "LIFE IS SO SHORT DON'T MISS THE NEW HEAVEN AND EARTH. 10:30 OCT. 1, 1986 BY THE HOWARD FINSTER FROM GOD TO YOU ALL. 5000. 685 WORKS OF ART I AM ONLY SAYING TO THIS WORLD THERE IS A BETTER LIFE A BETTER WORLD." The back in magic marker adds "... I LOVE YOU ALL AND HAVE SPENT A LIFETIME JUST TO TELL YOU I WANT YOU TO BE WITH ME IN HEAVEN THIS IS THE MOST REAL THING I KNOW OF. (signed) Howard Finster." 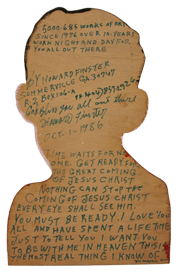 We also purchased the "Emage of Hank Williams" from Art Jones Gallery approximately the same time as "Howard in 1944." It is a 16" cut out painted on re-purposed 1/2" formica covered press board. It reads: 10:12 OCT. 22, 1986. "HOWARD FINSTER FROM GOD 5000. 754 WORK. WE LIKE HANK. GOD BLESS ALL." The back repeats much of the front with his signature, number, time and date which although protected is visible only from an angle. We were given a screen print on card stock 10,000. 040 from 3:22 January 23, 1989 and a "Yoke of Faith" numbered 6000.570 date 8:33 pm: May 12, 1987. Friends Amos Miller and Sharon Lombard Miller brought them back having purchased them during a sojourn to Paradise Valley in 1989. J.F. Turner's "Howard Finster: Man of Vision" and Tom Patterson's "Howard Finster: Stranger From Another World" are knowing, authoritative documentaries of the artist, his individual works, Paradise Garden his home and the environment he created. He and his legacy of dedication to God and his vision are widely revered and remembered in television documentaries, exhibitions, and representation.